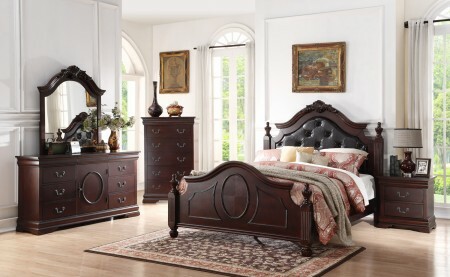 B518 traditional bedroom set in rich cappuccino finish made of wood and veneer. Four ball shape posts bed with button tufted design leather headboard. Six drawer dresser has a cabinet in the middle and all the case goods drawers accented by brass hardware. Top panel includes hidden jewelry boxes with felt lining perfect for small valuables.